This chapter explains the concepts and tasks relating to SQL plan management using the DBMS_SPM package. This topic describes the available interfaces and basic tasks for SQL plan management. You can configure the capture and use of SQL plan baselines, and the SPM Evolve Advisor task. To view the plans stored in the SQL plan baseline for a specific statement, use the DBMS_XPLAN.DISPLAY_SQL_PLAN_BASELINE function. This function uses plan information stored in the plan history to display the plans. Using DBMS_SPM, you can initiate the bulk load of a set of existing plans into a SQL plan baseline. You can use PL/SQL or Cloud Control to manually evolve an unaccepted plan to determine whether it performs better than any plan currently in the plan baseline. You can remove some or all plans from a SQL plan baseline. This technique is sometimes useful when testing SQL plan management. The SQL management base is a part of the data dictionary that resides in the SYSAUX tablespace. It stores statement logs, plan histories, SQL plan baselines, and SQL profiles. "Migrating Stored Outlines to SQL Plan Baselines"
You can access the DBMS_SPM package through Cloud Control or through the command line. This topic explains the basic tasks in using SQL plan management to prevent performance regressions and enable the optimizer to consider new execution plans. The SQL Plan Control page in Cloud Control is a GUI that shows information about SQL profiles, SQL patches, and SQL plan baselines. On the command line, use the DBMS_SPM and DBMS_XPLAN PL/SQL packages to perform most SQL plan management tasks. Log in to Cloud Control with the appropriate credentials. Under the Targets menu, select Databases. In the list of database targets, select the target for the Oracle Database instance that you want to administer. If prompted for database credentials, then enter the minimum credentials necessary for the tasks you intend to perform. From the Performance menu, select SQL, then SQL Plan Control. The SQL Plan Control page appears. Click Files to view the SQL Plan Baseline subpage, shown in Figure 29-1. Description of "Figure 29-1 SQL Plan Baseline Subpage"
You can perform most SQL plan management tasks in this page or in pages accessed through this page. "Managing the SPM Evolve Advisor Task"
The following table describes the most relevant DBMS_SPM procedures and functions for creating, dropping, and loading SQL plan baselines. This procedure changes configuration options for the SMB in name/value format. This procedure creates a staging table that enables you to transport SQL plan baselines from one database to another. This function drops some or all plans in a plan baseline. This function loads plans in the shared SQL area (also called the cursor cache) into SQL plan baselines. This function loads plans in an STS into SQL plan baselines. This function loads plans from AWR into SQL plan baselines. This function packs SQL plan baselines, which means that it copies them from the SMB into a staging table. This function unpacks SQL plan baselines, which means that it copies SQL plan baselines from a staging table into the SMB. Also, you can use DBMS_XPLAN.DISPLAY_SQL_PLAN_BASELINE to show one or more execution plans for the SQL statement identified by SQL handle. "About the DBMS_SPM Evolve Functions" describes the functions related to SQL plan evolution. Set initialization parameters to control whether the database captures and uses SQL plan baselines, and whether it evolves new plans. See "Configuring SQL Plan Management". Display plans in a SQL plan baseline. See "Displaying Plans in a SQL Plan Baseline". Manually load plans into SQL plan baselines. Load plans from AWR, SQL tuning sets, the shared SQL area, a staging table, or stored outlines. See "Loading SQL Plan Baselines". Manually evolve plans into SQL plan baselines. Use PL/SQL to verify the performance of specified plans and add them to plan baselines. See "Evolving SQL Plan Baselines Manually". Drop all or some plans in SQL plan baselines. See "Dropping SQL Plan Baselines". Alter disk space limits and change the length of the plan retention policy. See "Managing the SQL Management Base". Migrate stored outlines to SQL plan baselines. See "Migrating Stored Outlines to SQL Plan Baselines". You control SQL plan management with the initialization parameters OPTIMIZER_CAPTURE_SQL_PLAN_BASELINES and OPTIMIZER_USE_SQL_PLAN_BASELINES. SPM Evolve Advisor is a SQL advisor that evolves plans that have recently been added to the SQL plan baseline. The advisor simplifies plan evolution by eliminating the requirement to do it manually. For any repeatable SQL statement that does not already exist in the plan history, the database does not automatically create an initial SQL plan baseline for the statement. If OPTIMIZER_CAPTURE_SQL_PLAN_BASELINES=true, then you can use the DBMS_SPM.CONFIGURE procedure to configure filters that determine which statements are eligible for plan capture. By default, no filters are configured, which means that all repeatable statements are eligible for plan capture. For any SQL statement that has an existing SQL plan baseline, the database automatically adds new plans to the SQL plan baseline as unaccepted plans. The settings of the preceding parameters are independent of each other. For example, if OPTIMIZER_CAPTURE_SQL_PLAN_BASELINES is true, then the database creates initial plan baselines for new statements even if OPTIMIZER_USE_SQL_PLAN_BASELINES is false. If the default behavior is what you intend, then skip this section. Setting the OPTIMIZER_CAPTURE_SQL_PLAN_BASELINES initialization parameter to true is all that is necessary for the database to automatically create an initial SQL plan baseline for any eligible SQL statement not already in the plan history. If OPTIMIZER_CAPTURE_SQL_PLAN_BASELINES=true, then you can use the DBMS_SPM.CONFIGURE procedure to create an automatic capture filter for repeatable statements. When you set the OPTIMIZER_USE_SQL_PLAN_BASELINES initialization parameter to false, the database does not use any plan baselines in the database. By default, when automatic baseline capture is enabled, the database creates a SQL plan baseline for every eligible repeatable statement, including all recursive SQL and monitoring SQL. Thus, automatic capture may result in the creation of an extremely large number of plan baselines. To limit the statements that are eligible for plan baselines, configure filters using the DBMS_SPM.CONFIGURE procedure. The OPTIMIZER_CAPTURE_SQL_PLAN_BASELINES parameter does not control the automatic addition of newly discovered plans to a previously created SQL plan baseline. In SQL*Plus, log in to the database with the necessary privileges. Show the current settings for SQL plan management. If the parameters are set as you intend, then skip the remaining steps. An automatic filter enables you to capture only statements that you want, and exclude noncritical statements. This technique saves space in the SYSAUX tablespace. The following table describes the relevant parameters of the DBMS_SPM.CONFIGURE procedure. The type of filter for automatic capture. Possible values are AUTO_CAPTURE_SQL_TEXT, AUTO_CAPTURE_PARSING_SCHEMA_NAME, AUTO_CAPTURE_MODULE, and AUTO_CAPTURE_ACTION. The search criteria for the automatic capture filter. The parameter uses this pattern when allow=>true. The parameter uses this pattern when allow=>false. A null value removes the filter for parameter_name entirely. allow Whether to include (true) or exclude (false) matching SQL statements and plans. If null, then the procedure ignores the specified parameter. However, you cannot configure multiple values for the same parameter in the same procedure. For example, you cannot specify multiple SQL text strings for AUTO_CAPTURE_SQL_TEXT. The DBA_SQL_MANAGEMENT_CONFIG view shows the current parameter values. The OPTIMIZER_CAPTURE_SQL_PLAN_BASELINES initialization parameter is set to true. You want to include only statements parsed in the sh schema to be eligible for baselines. You want to exclude statements that contain the text TEST_ONLY. Optionally, to confirm the filters, query DBA_SQL_MANAGEMENT_CONFIG. Typically, you might want to disable one or two plan baselines, but not all of them. A possible use case might be testing the benefits of SQL plan management. Connect SQL*Plus to the database with the appropriate privileges, and then show the current settings for SQL plan management. By default, SYS_AUTO_SPM_EVOLVE_TASK runs daily in the scheduled maintenance window. No separate scheduler client exists for the Automatic SPM Evolve Advisor task. Configure automatic plan evolution by specifying the task parameters using the DBMS_SPM.SET_EVOLVE_TASK_PARAMETER procedure. The SPM Evolve Advisor task can accept more than one plan for a single statement. SPM Evolve Advisor locates unaccepted plans that the optimizer added to the SMB during earlier hard parses. In some cases, more optimal plans may reside in other locations. 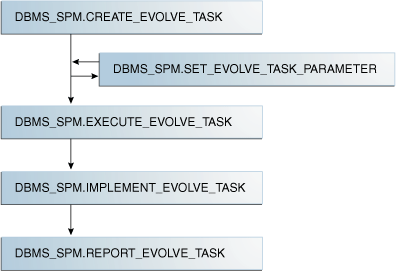 By using the DBMS_SPM.SET_EVOLVE_TASK_PARAMETER procedure, you can configure the automatic task to search the shared SQL area, AWR repository, or SQL tuning sets for plans that are not yet in the SMB plan history. If the advisor finds eligible plans in alternative locations, then it includes them along with the other unaccepted plans. By default, the automatic task does not search alternative locations. One client controls both Automatic SQL Tuning Advisor and Automatic SPM Evolve Advisor. Thus, the same task enables or disables both. Because the SYS_AUTO_SPM_EVOLVE_TASK task is owned by SYS, only SYS can set task parameters. The following table describes some of the procedure parameters. Determines which sources to search for additional plans: CURSOR_CACHE, AUTOMATIC_WORKLOAD_REPOSITORY, or SQL_TUNING_SETS. Combine multiple values with the plus sign (+). The default is CURSOR_CACHE+AUTOMATIC_WORKLOAD_REPOSITORY. Determines which alternative plans should be loaded. EXISTING, which is the default, loads plans with for statements with existing baselines. NEW loads plans for statements without a baseline, in which case a new baseline is created. Combine multiple values with the plus sign (+). Specifies the maximum number of plans to load in total (that is, not for each SQL statement). The default is 10. Specifies whether to accept recommended plans automatically. When ACCEPT_PLANS is true (default), SQL plan management automatically accepts all plans recommended by the task. When set to false, the task verifies the plans and generates a report if its findings, but does not evolve the plans. You want the database to accept plans automatically. You want the task to time out after 1200 seconds per execution. Connect SQL*Plus to the database as SYS. Query the current parameter settings for SYS_AUTO_SPM_EVOLVE_TASK. Optionally, confirm your changes by querying the current parameter settings for SYS_AUTO_SPM_EVOLVE_TASK. The following table describes the relevant parameters for the DBMS_XPLAN.DISPLAY_SQL_PLAN_BASELINE function. SQL handle of the statement. Retrieve the SQL handle by joining the V$SQL.SQL_PLAN_BASELINE and DBA_SQL_PLAN_BASELINES views on the PLAN_NAME columns. Name of the plan for the statement. This section explains how to show plans in a baseline from the command line. If you use Cloud Control, then display plan baselines from the SQL Plan Baseline subpage shown in Figure 29-1. Connect SQL*Plus to the database with the appropriate privileges, and then obtain the SQL ID of the query whose plan you want to display. For example, assume that a SQL plan baseline exists for a SELECT statement with the SQL ID 31d96zzzpcys9. Query the plan by SQL ID. The results show that the plan for SQL ID 31d96zzzpcys is named SQL_PLAN_52gvzja8jfysuc0e983c6 and was captured automatically. The DBMS_SPM package enables you to load plans from multiple sources. This topic explains how to load plans from AWR using PL/SQL. This topic explains how to load plans from the shared SQL area, also called the cursor cache, using PL/SQL. A SQL tuning set (STS) is a database object that includes one or more SQL statements, execution statistics, and execution context. You may want to transfer optimal plans from a source database to a different destination database. Load plans from Automatic Workload Repository (AWR) snapshots. You must specify the beginning and ending of the snapshot range. Optionally, you can apply a filter to load only plan that meet specified criteria. By default, the optimizer uses the loaded plans the next time that the database executes the SQL statements. Load plans for statements directly from the shared SQL area, which is in the shared pool of the SGA. By applying a filter on the module name, the schema, or the SQL ID you identify the SQL statement or set of SQL statements to capture. The optimizer uses the plans the next time that the database executes the SQL statements. Loading plans directly from the shared SQL area is useful when application SQL has been hand-tuned using hints. Because you probably cannot change the SQL to include the hint, populating the SQL plan baseline ensures that the application SQL uses optimal plans. Capture the plans for a SQL workload into an STS, and then load the plans into the SQL plan baselines. The optimizer uses the plans the next time that the database executes the SQL statements. Bulk loading execution plans from an STS is an effective way to prevent plan regressions after a database upgrade. Use the DBMS_SPM package to define a staging table, DBMS_SPM.PACK_STGTAB_BASELINE to copy the baselines into a staging table, and Oracle Data Pump to transfer the table to another database. On the destination database, use DBMS_SPM.UNPACK_STGTAB_BASELINE to unpack the plans from the staging table and put the baselines into the SMB. A use case is the introduction of new SQL statements into the database from a new application module. A vendor can ship application software with SQL plan baselines for the new SQL. In this way, the new SQL uses plans that are known to give optimal performance under a standard test configuration. Alternatively, if you develop or test an application in-house, export the correct plans from the test database and import them into the production database. Migrate stored outlines to SQL plan baselines. After the migration, you maintain the same plan stability that you had using stored outlines while being able to use the more advanced features provided by SQL Plan Management, such as plan evolution. See . Load plans with the LOAD_PLANS_FROM_AWR function of the DBMS_SPM package. The following table describes some function parameters. Number of the beginning snapshot in the range. Required. Number of the ending snapshot in the range. Required. A filter applied to AWR to select only qualifying plans to be loaded. The default null means that all plans in AWR are selected. The filter can take the form of any WHERE clause predicate that can be specified against the column DBA_HIST_SQLTEXT.SQL_TEXT. An example is basic_filter => 'sql_text like ''SELECT /*LOAD_STS*/%'''. Default NO means the loaded plans are used as nonfixed plans. YES means the loaded plans are fixed plans. "Plan Selection" explains that the optimizer chooses a fixed plan in the plan baseline over a nonfixed plan. This section explains how to load plans using the command line. In Cloud Control, go to the SQL Plan Baseline subpage (shown in Figure 29-1) and click Load to load plan baselines from AWR. You want the loaded plans to be nonfixed. The user sh has privileges to query DBA_HIST_SNAPSHOT and DBA_SQL_PLAN_BASELINES, execute DBMS_WORKLOAD_REPOSITORY.CREATE_SNAPSHOT, and execute DBMS_SPM.LOAD_PLANS_FROM_AWR. Log in to the database with the appropriate privileges, and then query the most recent 3 AWR snapshots. Query sh.sales, using the LOAD_AWR tag to identify the SQL statement. Take a new AWR snapshot. Query the most recent 3 AWR snapshots to confirm that a new snapshot was taken. Load the plans for the most recent 2 snapshots from AWR. In the preceding example, the variable v_plan_cnt contains the number of plans that were loaded. Query the data dictionary to ensure that the plans were loaded into the baseline for the LOAD_AWR statement. The output shows that the plan is accepted, which means that it is in the plan baseline for the statement. Also, the origin is MANUAL-LOAD-FROM-AWR, which means that the statement was loaded manually from AWR rather than automatically captured. Load plans with the LOAD_PLANS_FROM_CURSOR_CACHE function of the DBMS_SPM package. The following table describes some function parameters. SQL statement identifier. Identifies a SQL statement in the shared SQL area. This section explains how to load plans using the command line. In Cloud Control, go to the SQL Plan Baseline subpage (shown in Figure 29-1) and click Load to load plan baselines from the shared SQL area. Connect SQL*Plus to the database with the appropriate privileges, and then determine the SQL IDs of the relevant statements in the shared SQL area. OPTIMIZER_ENV_HASH_VALUE AS "Opt Env Hash"
The preceding output shows that the SQL ID of the statement is 27m0sdw9snw59. Load the plans for the specified statements into the SQL plan baseline. Query the data dictionary to ensure that the plans were loaded into the baseline for the statement. The output shows that the plan is accepted, which means that it is in the plan baseline for the statement. Also, the origin is MANUAL-LOAD-FROM-CC, which means that the statement was loaded manually from the shared SQL area rather than automatically captured. You can load plans with the DBMS_SPM.LOAD_PLANS_FROM_SQLSET function or using Cloud Control. The following table describes some function parameters. Name of the STS from which the plans are loaded into SQL plan baselines. A filter applied to the STS to select only qualifying plans to be loaded. The filter can take the form of any WHERE clause predicate that can be specified against the view DBA_SQLSET_STATEMENTS. An example is basic_filter => 'sql_text like ''SELECT /*LOAD_STS*/%'''. This section explains how to load plans from the command line. In Cloud Control, go to the SQL Plan Baseline subpage (shown in Figure 29-1) and click Load to load plan baselines from SQL tuning sets. You have loaded the plan from the shared SQL area into the SQL tuning set named SPM_STS, which is owned by user SPM. Connect SQL*Plus to the database with the appropriate privileges, and then verify which plans are in the SQL tuning set. The output shows that the plan for the select /*LOAD_STS*/ statement is in the STS. Load the plan from the STS into the SQL plan baseline. The basic_filter parameter specifies a WHERE clause that loads only the plans for the queries of interest. The variable v_plan_cnt stores the number of plans loaded from the STS. Query the data dictionary to ensure that the plan was loaded into the baseline for the statement. The following statement queries the DBA_SQL_PLAN_BASELINES view (sample output included). The output shows that the plan is accepted, which means that it is in the plan baseline. Also, the origin is MANUAL-LOAD-FROM-STS, which means that the plan was loaded manually from a SQL tuning set rather than automatically captured. For example, you may have investigated a set of plans on a test database and confirmed that they have performed well. You may then want to load these plans into a production database. A staging table is a table that, for the duration of its existence, stores plans so that the plans do not disappear from the table while you are unpacking them. Use the DBMS_SPM.CREATE_STGTAB_BASELINE procedure to create a staging table. To pack (insert row into) and unpack (extract rows from) the staging table, use the PACK_STGTAB_BASELINE and UNPACK_STGTAB_BASELINE functions of the DBMS_SPM package. Oracle Data Pump Import and Export enable you to copy the staging table to a different database. Description of "Figure 29-2 Loading Plans from a Staging Table"
Export plans with the PACK_STGTAB_BASELINE function of the DBMS_SPM package, and then import them with UNPACK_STGTAB_BASELINE. The following table describes some function parameters. Specifies the table to be imported or exported. Origin of SQL plan baseline. These procedures accept all possible values of DBA_SQL_PLAN_BASELINES.ORIGIN as the origin argument. For example, the origin parameter permits MANUAL-LOAD-FROM-STS, MANUAL-LOAD-FROM-AWR, and MANUAL-LOAD-FROM-CC. You want to create a staging table named stage1 in the source database. You want to load all plans owned by user spm into the staging table. You want to transfer the staging table to a destination database. You want to load the plans in stage1 as fixed plans. Connect SQL*Plus to the source database with the appropriate privileges, and then create a staging table using the CREATE_STGTAB_BASELINE procedure. On the source database, pack the SQL plan baselines you want to export from the SQL management base into the staging table. The following example packs enabled plan baselines created by user spm into staging table stage1. Select SQL plan baselines using the plan name (plan_name), SQL handle (sql_handle), or any other plan criteria. The table_name parameter is mandatory. Export the staging table stage1 into a dump file using Oracle Data Pump Export. Transfer the dump file to the host of the destination database. 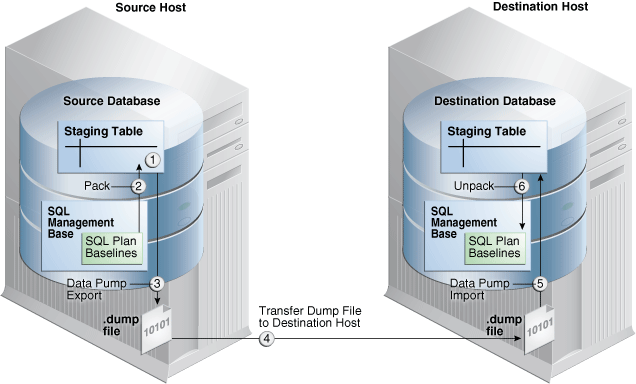 On the destination database, import the staging table stage1 from the dump file using the Oracle Data Pump Import utility. On the destination database, unpack the SQL plan baselines from the staging table into the SQL management base. This topic describes the most relevant DBMS_SPM functions for managing plan evolution. Execute evolution tasks manually or schedule them to run automatically. This topic describes a typical use case in which you create and execute a task, and then implement its recommendations. This function accepts one recommendation to evolve a single plan into a SQL plan baseline. This function updates the value of an evolve task parameter. Oracle recommends that you configure SPM Evolve Advisor to run automatically. You can also evolve SQL plan baselines manually. The following graphic shows the basic workflow for managing SQL plan management tasks. Description of "Figure 29-3 Evolving SQL Plan Baselines"
The following table describes some parameters of the CREATE_EVOLVE_TASK function. SQL handle of the statement. The default NULL considers all SQL statements with unaccepted plans. Plan identifier. The default NULL means consider all unaccepted plans of the specified SQL handle or all SQL statements if the SQL handle is NULL. Time limit in number of minutes. The time limit for first unaccepted plan equals the input value. The time limit for the second unaccepted plan equals the input value minus the time spent in first plan verification, and so on. The default DBMS_SPM.AUTO_LIMIT means let the system choose an appropriate time limit based on the number of plan verifications required to be done. User-specified name of the evolution task. This section explains how to evolve plan baselines from the command line. In Cloud Control, from the SQL Plan Baseline subpage, select a plan, and then click Evolve. You do not have the automatic evolve task enabled. You want to create two indexes to improve the query performance, and then evolve the plan that uses these indexes if it performs better than the plan currently in the plan baseline. Enable the automatic capture of SQL plan baselines. Execute the SELECT /* q1_group_by */ statement for the first time. Because the database only captures plans for repeatable statements, the plan baseline for this statement is empty. Query the data dictionary to confirm that no plans exist in the plan baseline. SQL plan management only captures repeatable statements, so this result is expected. Execute the SELECT /* q1_group_by */ statement for the second time. Query the data dictionary to ensure that the plans were loaded into the plan baseline for the statement. The output shows that the plan is accepted, which means that it is in the plan baseline for the statement. Also, the origin is AUTO-CAPTURE, which means that the statement was automatically captured and not manually loaded. Explain the plan for the statement and verify that the optimizer is using this plan. The note indicates that the optimizer is using the plan shown with the plan name listed in the previous step. Create two indexes to improve the performance of the SELECT /* q1_group_by */ statement. Execute the select /* q1_group_by */ statement again. Because automatic capture is enabled, the plan baseline is populated with the new plan for this statement. Query the data dictionary to ensure that the plan was loaded into the SQL plan baseline for the statement. The following statement queries DBA_SQL_PLAN_BASELINES (sample output included). The output shows that the new plan is unaccepted, which means that it is in the statement history but not the SQL plan baseline. Explain the plan for the statement and verify that the optimizer is using the original unindexed plan. The note indicates that the optimizer is using the plan shown with the plan name listed in Step 3. Connect as an administrator, and then create an evolve task that considers all SQL statements with unaccepted plans. Now that the task has been created and has a unique name, execute the task. This report indicates that the new execution plan, which uses the two new indexes, performs better than the original plan. Implement the recommendations of the evolve task. Query the data dictionary to ensure that the new plan is accepted. The output shows that the new plan is accepted. Clean up after the example. Drop plans with the DBMS_SPM.DROP_SQL_PLAN_BASELINE function. This function returns the number of dropped plans. The following table describes input parameters. Name of a specific plan. Default NULL drops all plans associated with the SQL statement identified by sql_handle. This section explains how to drop baselines from the command line. In Cloud Control, from the SQL Plan Baseline subpage, select a plan, and then click Drop. Connect SQL*Plus to the database with the appropriate privileges, and then query the data dictionary for the plan baseline. Drop the SQL plan baseline for the statement. The following example drops the plan baseline with the SQL handle SQL_b6b0d1c71cd1807b, and returns the number of dropped plans. Specify plan baselines using the plan name (plan_name), SQL handle (sql_handle), or any other plan criteria. The table_name parameter is mandatory. Confirm that the plans were dropped. Use the DBMS_SPM.CONFIGURE procedure to set configuration options for the SMB and the maintenance of SQL plan baselines. A weekly background process measures the total space occupied by the SMB. A weekly scheduled purging task manages disk space used by SQL plan management. The DBA_SQL_MANAGEMENT_CONFIG view shows the current configuration settings for the SMB. The following table describes the parameters in the PARAMETER_NAME column. Maximum percent of SYSAUX space that the SQL management base can use. The default is 10. The allowable range for this limit is between 1% and 50%. Number of weeks to retain unused plans before they are purged. The default is 53. AUTO_CAPTURE_PARSING_SCHEMA_NAME A list of the form (% LIKE a OR % LIKE b ...) AND (% NOT LIKE c AND % NOT LIKE d ...), which is the internal representation of the parsing schema name filter. If no parsing schema filters exist, then one side of the outer conjunction will be absent. AUTO_CAPTURE_MODULE A list of the form (% LIKE a OR % LIKE b ...) AND (% NOT LIKE c AND % NOT LIKE d ...), which is the internal representation of the module filter. If no module filters exist, then one side of the outer conjunction will be absent. AUTO_CAPTURE_ACTION A list of the form (% LIKE a OR % LIKE b ...) AND (% NOT LIKE c AND % NOT LIKE d ...), which is the internal representation of the action filter. If no action filters exist, then one side of the outer conjunction will be absent. AUTO_CAPTURE_SQL_TEXT A list of the form (% LIKE a OR % LIKE b ...) AND (% NOT LIKE c AND % NOT LIKE d ...), which is the internal representation of the SQL text filter. If no SQL text filters exist, then one side of the outer conjunction will be absent. "Eligibility for Automatic Initial Plan Capture"
When the defined limit is exceeded, the process writes a warning to the alert log. The database generates alerts weekly until either the SMB space limit is increased, the size of the SYSAUX tablespace is increased, or the disk space used by the SMB is decreased by purging SQL management objects (SQL plan baselines or SQL profiles). This task explains how to change the limit with the DBMS_SPM.CONFIGURE procedure. The current SMB space limit is the default of 10%. Connect SQL*Plus to the database with the appropriate privileges, and then query the data dictionary to see the current space budget percent. WHERE TABLESPACE_NAME = 'SYSAUX' ) AS "CURRENT_LIMIT_IN_MB"
Query the data dictionary to confirm the change. The task runs as an automated task in the maintenance window. The database purges plans that have not been used for longer than the plan retention period, as identified by the LAST_EXECUTED timestamp stored in the SMB for that plan. The default retention period is 53 weeks. The period can range between 5 and 523 weeks. This task explains how to change the plan retention period with the DBMS_SPM.CONFIGURE procedure. In Cloud Control, set the plan retention policy in the SQL Plan Baseline subpage (shown in Figure 29-1). Connect SQL*Plus to the database with the appropriate privileges, and then query the data dictionary to see the current plan retention period.